After talking one afternoon, we thought it would be an amazing thing to have all of us to join together for the next few months, get to know each other better, and commune together, in some fun and magical way. That way turned into sharing awesome recipes with each other, which would then revolve around a special ingredient challenge each month! We're so excited to share this with you; to learn together, to hang out together, and most importantly- to cook together. I mean, what better way to love on your blogging neighbor than with food, amiright? Food = Happiness. We're all about that. I don't know about you, but when a friend or dear one shares their grandmother's secret cake recipe, or emails me a pin from their favorite blogger's repertoire, I get kiddy with glee. It's such a great way to serve one another- by sharing recipes one can make for their own family and friends. That's kind of what this is all about. Let's dive in shall we? 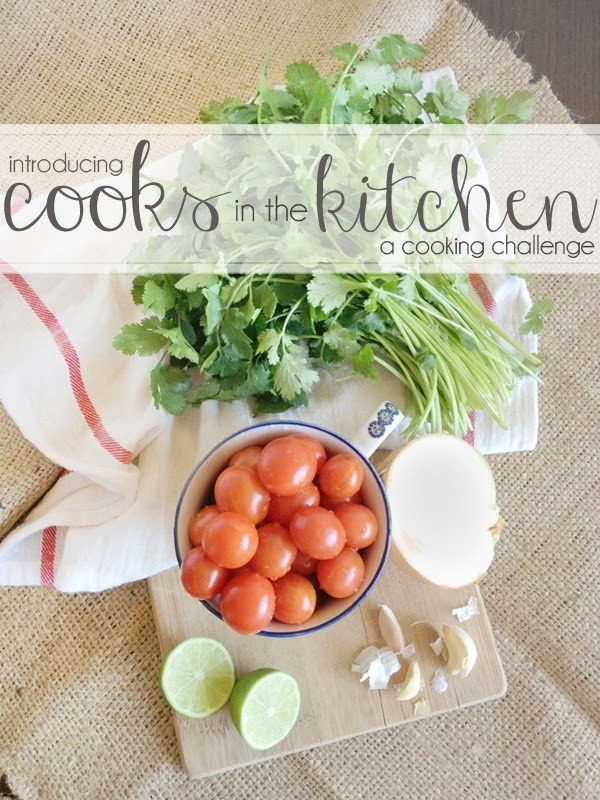 Cooks in the Kitchen is an opportunity to meet new bloggers, readers, friends; and COOK. Samantha and I will provide you with your main ingredient to cook with the first Friday of every month. Then you have the rest of that month to scour through your recipes and find the perfect one. We will have a link up blog post on both of our blogs where you can submit your recipe and blog post of your cooking creation, the fourth Friday of the month. There we will also announce the next ingredient challenge for the next month. You can use whatever recipe you wish (either out of your head or from another source- please cite source accordingly); just make sure your recipe includes the main ingredient listed. Also, please refrain from sharing your recipe or posting your blog post until the link up date! :) We want it to be a surprise for everyone. Everyone! We want everyone to join us even if you're not a blogger. So spread the word to all your cooking and baking friends! Also, during this time, make sure you share your cooking adventures on Instagram, Twitter, Pinterest, or Facebook using the hashtag #cooksinthekitchen2014 ! Which means if you're not a blogger, we'll still be able to be a part of your journey through your social media! Wheeee! Can't wait to see all the processes! Our first challenge begins today! Wooohooo! So get your baking and cooking senses tingling! 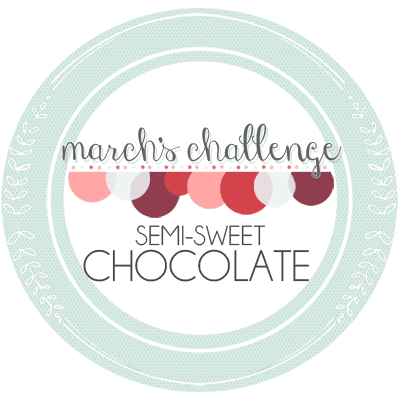 The link up for this month's challenge will be posted on both of our blogs Friday, March 28th. So make sure you come back and mark it on your calendars. This challenge will continue through September, ending Friday, September 26th. Samantha and I decided it would be amazing to do a giveaway during the final link-up. Giveaway details will be revealed at a later date. But don't you worry, we're crazy excited about it. Like, cray-cray. So that being said, are you ready to get cooking???? Yep chocolate! Not just any chocolate though- Semi-Sweet! Yum to the O! We decided to start off easy and do a theme we knew everyone could handle. This type of chocolate is the perfect balance of sweet and bitter, in our opinion and tastes great in so many recipes. I use it in everything! So get out there and find this is in chip form, blocks, whatever and get to cooking! 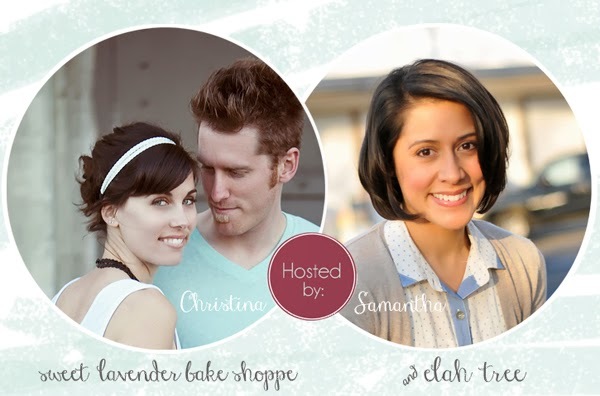 Be ready to post your blog and submit your recipe March 28th! Can't wait to see all of your semi-sweet chocolate creations! Oh! Some months might be easier ingredients, some months harder, and some months will feature savory instead of sweet! We want to get everyone involved, not just bakers and/or cooks! We are so excited for these next few months and can't wait for you to join us! Please let us know if you have any questions and don't forget to grab a button, place it on your sidebar, and tell all your friends! Happy cooking and see you back here March 28th! This is so exciting! Thank you for being so amazing! Can't wait to share with everyone! Eeeep! Right??? I can't wait to see what you come up with! oooh!!! This is so exciting!! I'm definitely going to link up! whoo hooo!!! Yay!!! I was hoping you would! Awesome! So happy you're going to be a part of it as well! I'm so excited for this! It's a great idea and a great opportunity to try new things. Recipes are definitely some of my favorite blog posts. Thankfully, my Whole30 challenge ends 3 days before, so I'll have enough time to whip up something chocolate-y. Yummmm! Yay! Perfect timing to join! So excited for it! SO excited you're joining! Can we join at any time? I'm actually without kitchen until this summer! But I soo so so want to do this! OR, will you be doing it again?